Objekte in Jesolo mit durchnschnittlich 4,3 von 5 Sternen. Ausstattung 26: Wunderbares Landhaus Villa Roma in Jesolo - Venedig. As a family with four people from Munich we had a great holiday in the appartment. 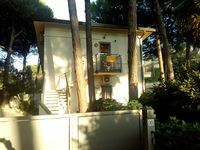 It is located in an area with holiday homes in between a lot of old pine trees, and big hotels or appartment blocks are not close by as in the City Center of Lido di Jesolo. We have cooked in the kitchen and also had a dinner in the garden with grilled fish on a build-in grill. Great to park the car on the grounds and close the gate to the road. A bakery, a fish shop and a small supermarket are in walking distance. The beach is also in walking distance also with carrying by hand a SUP (stand up paddling) board. The grounds of the appartment are great to keep SUP boards or surf boards over night. The &quot;free&quot; beach was not crowed during our stay with a lot of space in the water to play ball. We could use a sun umbrella from the appartment for our time on the beach. The appartment has a powerful air conditioning and a large refrigerator plus a small freezer. Angelo is a very nice and helpful landlord. He was there on our arrival (waiting for us because traffic jams) and presented us a bottle of water and a bottle of red wine. He did all the registration work in Jesolo for us and we could enjoy our stay. He also personally said good bye to us. We would come back to the appartment for our next visit in Jesolo.